Now in its fifth year, International Sherry Week 2018 (October 8th - 14th) celebrates this unique and versatile beverage with classes, tastings, cocktail competitions and many other special events happening all across the globe. For more information visit the Sherry Wine website and, New Yorkers, don’t miss the The Great Sherry Tasting: New York tonight, October 9th from 7-10pm at the historic Pier A Harbor House in lower Manhattan. The tasting will featuring over 100 Sherry wines, both dry and sweet, from nearly 20 bodegas (Admission is $25 and an additional $15 for the Sherry In Cocktails seminar, 7:30-8:30pm). To get you started in your week-long Sherry mode, here’s a re-post of an article I wrote in 2016 about one of my favorite types: dry Sherry. The only Michelin-starred restaurant in Seville, Abantal, serves several sherries to pair with the food. Here, a creamy beet soup and an Oyster with cauliflower puree. YUM!! You may see the word “Sherry” in the title above and think, "I don't like sweet wines so let's skip this one" but wait! I'm not going to talk about sweet dessert wine here. The majority of Sherries are crisp, complex and dry. These wines stand up to and enhance the flavor of many types of food. Not long ago I embarked on a wine-lover's trip to the Andalucia area of Southern Spain and stopped in for a couple of days at the birthplace of Sherry, Jerez as it is called there. I visited several bodegas, the place where the wine is made, bottled and stored. I met with winemakers who are passionate about their craft and, best of all, I was able to taste a number of different styles of Sherry, some straight out of the barrel. Take a look at my video from the Gonzalez Byass bodega where the charming master blender and winemaker Antonio Flores Pedregosa tried to teach me to use a venecia, a long rod with a tiny cup at the end, used to pour wine straight from the barrel into a glass. What a shame most of that delicious liquid ended up on my shoes! All dry sherry is made from the Palomino grape and aged either biologically or oxidatively, using the unique solera system in stacked barrels. Let's take a look at the two types of aging, the resulting wine and, the best part, food pairings! Reflections from A special glass-sided Sherry barrel. This way, visitors can see the protective yeast, known as flor, on top of the wine. Fino and Manzanilla sherry ages biologically under a layer of protective yeast called the flor. Like a blanket on top of the wine, it prevents oxidation, keeping the wine fresh, while imparting flavors and enticing aromas of nuts, yeast, dough, dried flowers and olive brine. The only difference between a Fino and a Manzanilla is that the latter has more of a saline quality from being matured in barrels in the town of Sanlucar de Barrameda, close to the sea. Both wines are practically clear in color and are bone-dry and should be served chilled like a white wine. My favorite way to enjoy a refreshing glass of Fino is with some salted marcona almonds, lightly fried food and a selection of interesting, but not too strong cheeses, such as aged Manchego or Tetilla, a light, creamy cheese. As for Manzanilla, I prefer fresh shellfish, perhaps briny oysters, clams, and mussels. Either style goes well with many types of food, ranging from Japanese sushi to specialty Spanish hams and olives. Take a look at my recipe here for Clams With Bacon, Corn, Tomatoes and Mushrooms. I served this dish with a Manzanilla from La Guita and it was a spot-on combination! delicious manzanilla and fino sherries from Lustau. Amontillado, Palo Cortado and Oloroso sherries have been aged at least partially without the protective flor. The exposure to oxygen in the barrel causes these wines to range in color from gold to golden brown, depending on the amount of time spent aging. They are dry and have very complex, rich, round, nutty flavors and should be served slightly chilled, but not as cold as you would serve a white wine. Amontillados and Palo Cortados go fabulously with soups as well as chicken and pork with a creamy sauces, or with a full-flavored cheese Spanish blue cheese like Cabrales. The nuttiness of these wines is enhanced by rich vegetables such as asparagus, cauliflower and spinach. The even fuller-bodied Olorosos go superbly with all kinds of strong, "stinky" cheeses, as well as cured meats and game — think partridge or venison — and even fish that is rich in oil: wild salmon, tuna, trout or mackerel. To my delight, I even enjoyed a glass of Oloroso with a spicy Chinese Kung Po Chicken. The richness of the wine held up well to and enhanced the spicy flavors in the dish. Getting ready to have some cured meats with an Oloroso Sherry. the dark color of the wine comes from oxidative aging in barrels. Notice the difference in color between the Fino (left) and the Amontillado (right) from Valdespino, another favorite producer. Finally, please don't use a tiny tulip-shaped glass when drinking sherry! If you are in a restaurant (in NYC try Pata Negra), ask for it to be served in a white wine glass. The larger bowl will allow the wine to express its full range of aromas and flavors. For me, there is no other wine that offers the age and complexity of Sherry for the price. It's now the time to break out a bottle with your favorite meal and say, Salud!! Standing inside the courtyard of the Lustau bodega I was captivated by the alluring smell coming from inside, where the precious juice was sleeping inside the barrels. The cellar where the famous Tio Pepe from Gonzalez Byass sherry is aged. Antonio from the amazing and historic Hotel Alfonso XIII in Seville, Pouring a refreshing Fino Sherry to have before dinner with olives, potato chips and marcona almonds. Fantastic!! 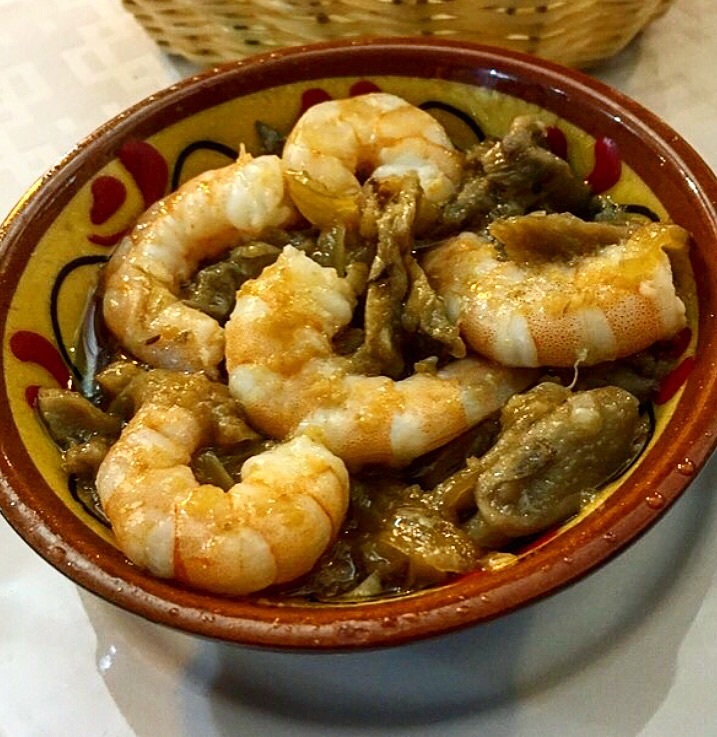 Below are some delicious food pairings I savored with dry sherry in Andalucia. fried fish sprinkled with sea salt. Shrimp is always a great Sherry pairing.